Here is some information on how Magnetic Therapy works and when you should use it on your horse. How does Magnetic Therapy work for horses? The magnetic field generated by the magnets in a magnetic rug or boot relaxes the capillary walls and surrounding muscle and soft tissue. As a result your horse will benefit from improved oxygen and blood flow which will help to promote healing and speed up the recovery process. Which type of magnets are the most effective? There are many different types of therapeutic magnets available. The strength of the magnet depends on size, depth, type of magnet etc. As long as they have a sufficient strength they will create a magnetic field strong enough to penetrate through the body. Magnets do not heal. It’s the magnetic field the magnet creates which influences the environment for accelerated healing to take place. Every horse can benefit from Magnetic Therapy. You can use the magnetic rug and boots as part of your daily routine. Use 30 minutes to an hour before exercise and for a similar time afterwards. Our magnetic products can be used overnight. 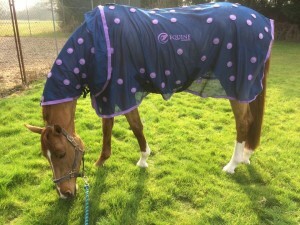 Travelling your horse in our magnetic rug will help to relieve any tension during the journey. Your horse will be warmed up and ready to work. Tendon, ligament injuries, fractures, navicular, arthritis, laminitis, and splints to a name a few… For more information on our magnetic therapy range and which product to use see our Magnetic Therapy Table. We strongly recommend you obtain a professional diagnosis from your vet before using magnetic therapy for an injury or condition. If you need more information on Magnetic Therapy or our products you may find the answer in our FAQ’s section. If not, please contact us at info@magnetixtherapy.com or call 01270 584564.